One of my most popular designs to date! Chandi is a Sanskrit term meaning "fierce goddess", and this is the perfect piece for the strong, beautiful, amazing woman in your life...especially if that's yourself! 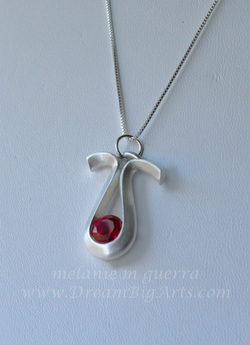 The original is made with a large lab ruby, pendant is approx 2 in long, on 18" sterling box chain. Allow 2 - 3 weeks for delivery, as each is custom made.